I have set my own church up in Aplos software and it is the first accounting software I recommend for my church clients. 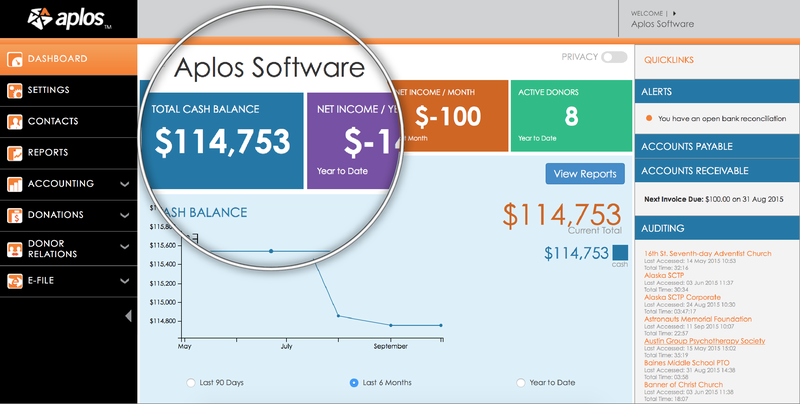 If you are looking for an easy to use, affordable accounting software for your church, I don’t hesitate to recommend Aplos. You can try out their church accounting software and get a discount by using my promo code: FCA30FOR12. Here are just some of the great reasons why I love Aplos software. special discount on Aplos Accounting! Enter promo code: "FCA30FOR12" to get 30% off for 12 months! Two things many small churches and nonprofits have in common is volunteer help and frequent turnovers. So it is imperative to have an accounting system set up that is simple to learn and use! Even if you have paid staff that has been with you forever simple and efficient is the key when it comes to your accounting. Aplos is a web-based software so there is nothing to install! This also makes it accessible from anywhere with an internet connection. It is automatically backed up every night, so no more worries about losing everything in the event of a computer crash. In my humble opinion, the best feature of Aplos is their support. It is the best I have had the pleasure of dealing with. Their staff is super nice and supportive! They will treat you like you are their one and only customer by taking time with all your questions. In the software itself on every screen in the bottom right corner there is an orange box with a question mark in it that you can click and ask any question and someone will respond back usually within 24 hours. The Aplos support team offers helpful videos you can watch to walk you through tasks set-by-step. They also have support by phone or email to help you if you have any questions when setting everything up and getting started. And the best part is, you get all of this support for free! Unlike some other accounting software that charge an arm and a leg for their support...Aplos support is absolutely free. Note: Aplos support is now charging a fee to upload your QuickBook and other "history" files AND make sure it loads up correctly. Give them a call and they will give you the details on that additional service. If you are bogged down in Quickbooks and need something simpler, Aplos support can import your QuickBook file and set up your chart of accounts in a snap! You can use the chart of account wizard or add them individually in the account section. You will love the change because Aplos software makes it simple to track your designated funds like your Missions or Building fund. You can also easily create annual giving statements. One of the great things about Aplos software is that it is made specifically for nonprofits and churches. Aplos was designed by a CPA/Executive Pastor so each section of the software was made with a non-accountant in mind, so it’s simple to manage your organization’s accounting even if you don’t have any accounting experience! Enter starting balances with ease. Set up funds to track designated funds with one click of a button. Tip: Stick with the concept of KISS (keep it super simple) for you AND the next person - don't set up 25 funds! Set up a budget and compare your budget to actual amounts throughout the year. Bank reconciliations are quick and easy. Transfers between funds is a snap with this software. Use the "Tag" function to tag things you would like to track such as Specific Fundraisers, Vacation Bible School, Women's Retreat, Youth Events, etc. You will be able to pull up reports and see exactly how much money that fundraiser brought in or how much that small registration fee offset the cost of that Women's Retreat. It is a lot easier than setting up a bunch of funds :) Also...I am tracking our guest speakers with 1099 tags, so I can send accurate 1099s each year. The possibilities for this one feature are endless. Enabling 990 Tags will add a required field to all transaction-entry screens of Aplos. This allows you to tag each transaction with the appropriate 990 classification, so that you can quickly generate the 990 Report from the Reports section. The Aplos Donation Module is my favorite part of Aplos! It is easier to enter donations in Aplos than any other software I have ever used AND it can be rolled right into your accounting ...so no more putting those donations in twice! Create contribution receipts and annual statements for your donors. Automatically track donations in the accounting. Having an online donation section will make it easier for your donors to give securely online plus save time as those donations are automatically integrated into Aplos accounting. See more on the online giving! Those of you in charge or over several churches or nonprofits should check out the Oversight account with Aplos. You can set up a default chart of accounts, track user activity, run multiple reports, and much more with an Oversight account. Aplos Standard Accounting - $25/mo - which includes, fund accounting, budgeting, bank integration, bank reconciliation, check printing, accounts receivable, accounts payable, reporting, and online giving. For a full list of features go to the Aplos pricing page. Most churches and nonprofits also include Aplos Contributions Management for $15 per month more to track the giving and donations and create contributions statements. And if you are a new church plant you can get the first 6 months free! You can also take it for a test drive for 15 days before you make up your mind :) Click here to start your free trial. Do you have a question, comment, or tip regarding using Aplos for a church or nonoprofit? Share it! can access to donations be made seperate from the book keeping part? I don't see anything about payroll and tax returns. I use QuickBooks and they take care of all that. APLOS software is terrific!! We've been using it for about 2 - 2 1/2 years and being the non accounting person that I am have had great success and some of the best customer service. They are growing and adding new features all the time while keeping it very affordable . I would highly recommend this church accounting software. Finally, someone has done what Intuit has failed to do for years!!! You built an intuitive, web-based, accounting system for non-profits that does TRUE fund accounting! I just entered my first batch of donations this morning and it took me about 1/3 the time as it did in QuickBooks! I'm thrilled! Disclosure: I am an affiliate of Aplos. I personally use their product and am very satisfied with it. If you like my site and decide that Aplos is a good fit for your organization, please use the "FCA30for12" discount code and then I will receive a commission and be able to keep this site going. BUT, if you don't want to, just don't use the code and I will receive no payment:) Either way...this is a very good product that is worth trying out with the free trial! See what others are saying about Aplos above.